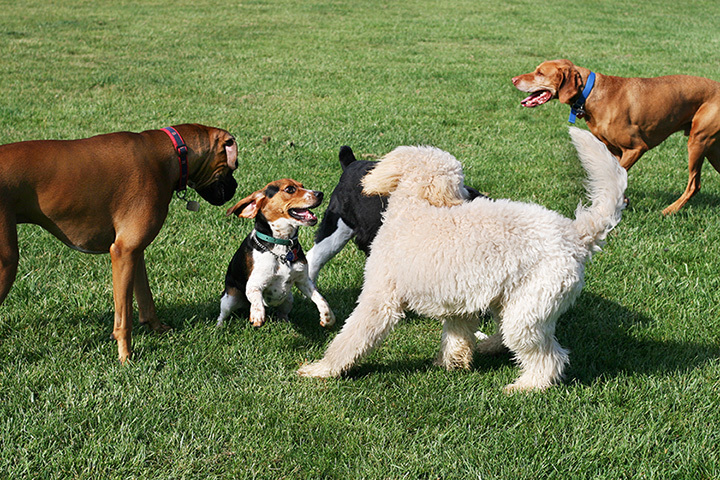 Central Bark, the first dog park in Grand Prairie, features three exercise areas designated for dogs. Each of the fenced areas - one for small dogs, one for large dogs and one reserved for rotating to preserve the turf - include shade structures with benches and water fountains for both the dogs and people. A sidewalk runs from the 40-space parking lot to the dog park entrance, and accessible paving extends into each of the off-leash areas. The fenced areas are accessed through a one-way gate system to prevent accidental passage of dogs from one area to another. Landscape, including trees, turf, sandstone boulders and adaptive grasses create natural, unmowed zones within each off-leash area. This dog park is dedicated to honor those thousands of dogs and dog handlers that have served and given their lives for America in times of war and peace.